Ward, I'm worried about the Buch - Cursed To First - Sox and Pats forever. Things I'm happy about: earning a split on the short series in Oakland; both bats and pitching keeping it together for the first road win of the year; and seeing Coco Crisp again, though I mourn the all-too-short life of the Froco. Things I'm not so happy about: Lifeless bats in game one. Bullpen implosion, ditto. Thing about which I am neither happy or unhappy, per se, but have some concern about despite yesterday's outcome: Clay Buchholz. Far be it from me to look down upon a win, and some would say a win is a win, quit looking for problems. Overall, Red Sox pitchers have been turning things around after an awful start. But another modern baseball mantra is that wins, losses and runs scored are not the best tools to judge pitching performance, since those three things are so dependent on outside factors, from the architecture of the ballpark to the performance of teammates on defense and at the plate. Luck in this last category also definitely played a role yesterday -- while Buch surrendered just one run, "keeping the game at bay," as Jason Varitek put it, that single run, a homer by Coco in the first inning, was the only thing Oakland had to show for a six-hit effort, with four walks tacked on besides. Meanwhile, Buch recorded only two strikeouts. That K-to-walk ratio (K/BB) is one of the things that has me concerned about just which direction Buchholz will go from here. It may be unfair to compare a small sample size to full-year numbers, but thus far, at least, things are still looking more like the problematic 2008 season than last year's commanding performance. In 2008, Buch posted his lowest K/BB yet, at 1.76. So far, over his four starts in 2011, that number's the lowest it's ever been -- under water at 14 walks vs. 10 strikeouts, for a ratio of 0.71. You could argue that Buch's never been a huge strikeout guy -- his best-ever K/BB ratio was in the fairy-tale season of 2007, at 2.20, and last year, in which he finished sixth in Cy Young voting, it was only a fraction higher than in 2008, at 1.79. Still, his WHIP (walks plus hits per innings pitched), at 1.77, remains the highest it's been since 2008, and substantially higher than last year's 1.203. And his ERA+ so far this year sits at 80, below league average. He finished the 2008 season with an even more dismal ERA+ of 69, but last year posted a league-leading ERA+ of 187 over 173 innings pitched. In 2008, many of Buch's problems seemed to be mental -- not challenging hitters, and completely losing his technique when he got into trouble. He isn't showing nearly as many signs of that now, and I believe he is a more mature pitcher. My theory about the cause of struggles for Buch more recently is more mechanical. Unlike your typical pitcher, he entered professional baseball with a God-given, Major-League-level curveball, and has had to work on bringing his fastball up to the same level. Unfortunately, what seems to have happened, at least from what I've seen, is that this has compromised the curve somewhat. When Buch struggles, he seems to have trouble locating that particular pitch, and it doesn't have quite the 12-6 crispness it had during his wunderkind year of 2007. 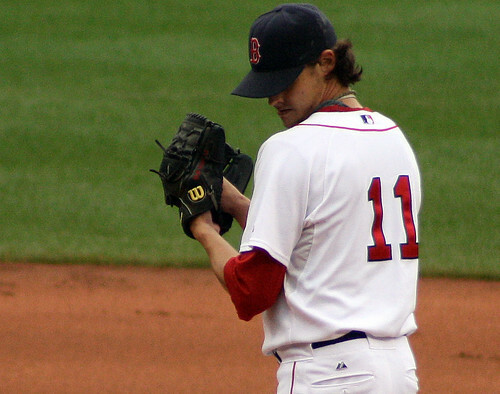 That said, Buchholz was a monster last year, and showed what he's capable of when he's got everything working. I still agree with Theo's apparent attachment to him when it comes to trade discussions, and hope that yesterday was the beginning of a turnaround for him this year. But in the meantime, I worry. Just a little bit. One other theory could be that it is difficult to throw an effective 12/6 curve in cold weather. Tough to get the grip and action just right.